While satisfaction is important, it is not sufficient to guarantee that your customers will continue to buy from you. It costs more to acquire a new customer than to maintain an existing customer. Existing customers play an even greater role in our ever-changing global economy - we must keep them and grow them. You build loyalty when you and your customers are aligned on seven key factors: emotional, structural, and business dependence; satisfaction; performance; economic value proposition; and alignment and fit. There are actions you can take to create long-term relationships between sellers and buyers. Learn what your customers value on a personal level and go beyond their expectations to demonstrate that you care about their needs. Show a high degree of empathy and responsiveness. Even if you can’t solve the problem on the spot, let them know they are important and that you will do what it takes to satisfy their personal needs. Put the right person on the job. Make sure your employees can provide this support and that you have the right processes in place for triaging issues. 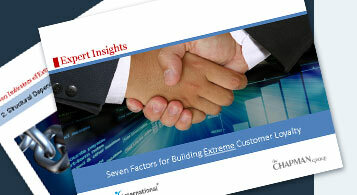 Understand how your customers’ organizations operate. Determine where they have gaps or inefficiencies. Then, suggest how you can help them operate their organizations better, cheaper, and with fewer headaches or risks for your customer. Identify areas where your customer is weak but you are strong, as well as areas where you are weak and your customer is strong. After conducting this analysis, identify opportunities for building on each other’s strengths and minimizing each other’s weaknesses. Creating high customer satisfaction starts with a careful assessment to determine needs and uncover expectations with regard to price, impact, and level of service. Then you must meet or exceed expectations. “How” you deliver can be as important as “what” you deliver, so don’t underestimate the impact emotions play in satisfaction scores. It is also important to know which performance factors really matter to your customers and which don’t. For the factors that do matter to your customers, it is important to understand how your customers define different performance levels and their minimum acceptable performance criteria. Collaborate with your customers to understand how your solutions are impacting them. The more people inside your customer's organization that understand the value you bring, the more loyal they will be. Help them reduce or avoid expenses. Help them increase revenue and profit. First, you need to know yourself. Think back to the customers who work best with you. Are there any common characteristics? Conversely, can you identify the customers you wish would go away? Are there any common characteristics that predict poor fit? Then use your criteria to segment your accounts into those who fit well and those who do not. Ask your customers “fit” questions as part of your strategic account planning process and manage them accordingly. Your success in an account will increase exponentially as you increase your collective knowledge, relationships, and economic value. Remember, a strategic account is an extremely valuable asset and must be managed as such.